Safety Awareness Archives - resqme, Inc. Your garage can be a killer! That’s an attention-grabbing claim, isn’t it? However, it’s not an exaggeration from a safety freak. It’s the truth, as statistics sadly show. People die in garage accidents all too often. Severe injuries are even more common. These tragedies are preventable. Here are six common causes of garage accidents and how to keep them from becoming a problem. The door is the most common culprit in garage accidents. According to statistics from the US Consumer Product Safety Commission, more than 30,000 injuries are caused by garage doors each year, and some of the injuries result in death. What can you do to prevent becoming part of these garage accident statistics? You know the old saying, right, so take preventative measures today by using this guide as a checklist. An organized garage is a safe garage and you’ll be making your garage a safer place for adults, kids and pets too. Author: Matt Milstead is a blogger and writer from Australia interested in and covering topics related to safety. As the father of a toddler, Matt enjoys nothing more than getting away from work and spending time traveling with his family. He can be reached on Twitter via @mattmlstd. Road safety is extremely important during the winter months. If you live and drive in a country that has freezing weather, you have to be extra vigilant as icy conditions can really harm you and your vehicle. Irish solicitors Hussey Fraser created this infographic which looks at all the facts and stats of road safety in Ireland and around the world. It even shows which countries drivers wear seatbelts the most! Everyone knows that you should never drive while intoxicated. If you are at all concerned for your ability to operate a vehicle with precision and clarity, you should not get behind the wheel. Breathometer offers two devices that help you estimate your blood alcohol concentration. The first device model attaches to the headphone port on your smartphone and requires the Breathometer app. You don’t need a mouthpiece to work this device and it gives you important information, such as when you should be sober again. The second model, called the Breeze, is completely wireless. You can even attach your car keys to it as a friendly reminder to yourself or friends. Best of all, it doesn’t require any warm up time and gives you your results in seconds. Like the Breathometer devices, Alcohoot uses a device that attaches to your smartphone and an app. It comes with eight mouthpieces, which should be replaced after each use. It uses an FDA-registered fuel cell sensor, which helps it give you more accurate results and is the same technology that the police and military use. It also includes a feature that helps you hail a cab if you are too intoxicated to drive and one that helps you locate open restaurants nearby. The BACtrack Vio device is one of the most portable devices. It is about the size of a pack of gum and is designed to be attached to a keychain. It gives you an estimation of when your blood alcohol content will return to 0.00 percent. It can be used with most iPhone and Android models. Although smartphones are a great way to monitor your general blood alcohol content, it is unwise to rely on them in place of general good judgment. Remember: It’s always best to avoid any amount of drinking when driving. A recent review of various devices indicated that while they all can tell you that you have had too much to drink in order to drive, each device may give you a different estimation of your blood alcohol content. These devices are a good jumping off point, but it is still vitally important to use sound judgment and know that any consumer-purchased device may not be entirely accurate. There are many other ways you can use your smartphone to prevent drinking and driving, as well. You can use a ridesharing service, such as Uber or Lyft, or you can call a cab or a friend to come pick you up. No matter where you are or what time it is, the safest choice is to not get behind the wheel. Check out alertme™: about the size of a Bluetooth, this lightweight earpiece is the latest and safest lifesaver electronic device that helps prevent accidents caused by falling asleep behind the wheel. The statistics don’t lie. Teenage drivers are responsible for an inordinately high proportion of motor vehicle accidents in the United States. The latest data from the Centers for Disease Control (CDC) suggests that 15-24 year old drivers are responsible for about 30 percent of accidents, even though they represent only 14 percent of the overall population. That means they are almost twice as likely to be involved in an accident than other age groups. It seems obvious that the most inexperienced group of drivers would account for the highest number of car crashes. While underestimating dangerous situations, following too closely and failing to account for inclement weather are some of the most common causes for accidents amongst teens, a lack of driving experience doesn’t tell the whole story. Teenage drivers also make poor decisions before even starting the car. Here are three easily avoidable choices that every new driver needs to be aware of. Most young drivers share a car with parents or other siblings, which makes inspecting your vehicle before you drive even more important. Walk around the car and visually check the tire pressure lights. Driving-tests.org has acomplete checklist of external features that should be inspected before you drive. Once inside, pay special attention to side and rearview mirror adjustment. Every driver has a preference when it comes to mirror placement, and you should always assume that someone has repositioned the mirrors since the last time you drove the car. Pick a fixed object in your blindspot–like a telephone pole or a parked car–and adjust the mirror until this object comes into view. Failure to account for other cars in a blind spot is one of the most common causes of accidents among new drivers. Your mirrors are the first line of defense. For teenagers, the ability to drive is synonymous with freedom, and that freedom typically includes picking up and transporting a carload of friends to school or the mall. However, the chance of an accident increases with each additional teenage passenger, according to the CDC. Every passenger is an opportunity for distraction and young passengers are far less likely to respect a driver’s need to focus on the road. During the first six months of driving, parents should limit the number of passengers to one. It’s the perfect number for getting your teen acclimated to driving with a controlled amount of distraction without them being overwhelmed by a car full of immature teens. Teen drivers may not have a lot of experience driving, but they do have a lot of experience riding in a motor vehicle and wearing a seat belt. That’s why it’s so strange that teenagers have the lowest rate of seatbelt use. The CDC reports that in 2013, only 55 percent of high school students reported that they always put on a seatbelt when riding in car. In general, teenagers are more likely to take short trips, which can give them a false sense of security about their own safety. Make sure your new driver knows that a seat belt is for every trip, not just high-speed interstate travel. You are just as likely to get in an accident driving down the street as you are driving across the country. They should also have a zero tolerance policy for passengers who won’t wear a seat belt. In reality, no one is too cool for a little safety. Over the years, lots of innovation has occurred in the name of improving driver safety. Nationwide programs have sought to eliminate distracted driving habits, roads are constantly maintained maximum safety, and cars are increasingly designed to better withstand accidents. Yet, the numbers associated with motor vehicle accidents remain staggering. According to a report from the National Highway Traffic Safety Administration1, an estimated 32,675 people died in motor vehicle accidents in the U.S. in 2014—down only 1 percent from 2013. Perhaps numbers like this one have inspired the launch of a number of innovative new products and services in recent years. Some of the newer ways of protecting drivers are attempting to do so by fixing very specific problems. Specifically, we’ve seen exciting new initiatives and products aimed at three areas: protecting drivers operating shipping projects, supplying average commuters with emergency tools, and training young drivers to practice safe habits. Commercial fleets conducting shipping business account for a huge number of vehicles, and it’s in the best interest of the companies involved to protect drivers. Furthermore, drivers in this business can sometimes operate with relatively high risk. They drive long hours, which leads to tired driving and distractions as drivers attempt to stay busy and entertained; they sometimes travel unfamiliar territory; and the physical aspect of operating a large fleet vehicle can be challenging. It’s actually GPS tracking associated with the ever-expanding “Internet Of Things” that’s beginning to change conditions for these types of drivers. According to Verizon’s Networkfleet Program2, GPS-based vehicle tracking can enable companies to track, monitor, and manage their vehicle fleets. Fleet management headquarters can now see where each individual vehicle is and even monitor the conditions of those vehicles. This enables them to manage driver hours, keep vehicles safe, and even map out the most efficient routes. These perks may appear to exist primarily for the sake of operational efficiency, but that same efficiency makes drivers less likely to adopt unsafe habits in an attempt to overcome poor conditions. A driver on a strictly monitored system is less likely to speed, cut corners, try unfamiliar routes, or stay active for dangerous hours. For that matter, resqme, Inc.’s alertme™ tool can also be very helpful for fleet drivers who do still have to work long hours, or for anyone driving with a risk of growing tired. The tool fits over your ear like a bluetooth and alerts you if you start to nod off! Most people know general safe driving techniques, whether or not they choose to follow them. There will always be struggle to get more drivers acting safely on the road. But among 30,000+ deaths that occur annually due to accidents, a number of them also occur due to unsafe circumstances that may not have to do specifically with a driver’s actions. Consider, for example, an incident reported last month in which a driver’s Ford Fiesta gradually caught fire for no apparent reason. The driver and his family saved themselves thanks to a persistent smokey smell that led to their exiting the vehicle. However, in some instances, similar issues can prove fatal due to car issues resulting in automatically locked doors and windows. The driver in this instance recommended to anyone reading the story to keep a hammer in the car at all times (so as to break a window if escaping the vehicle is an issue). But this is also where some of our own resqme® products can help. The resqme® Original Keychain in particular can be a life saver in situations that would otherwise result in more accident-related deaths, as it helps with escape from seat belts and sealed cars. We’ve also seen various companies taking steps to help with the education process as it applies to young drivers. Every young driver goes through a period of instruction in order to receive a license, and the hope is that the lessons learned during this stage will last. But unfortunately, young drivers are among the worst offenders when it comes to distracted driving in particular, and in turn are responsible for a significant portion of motor vehicle accidents. Perhaps the most interesting company combatting this trend is SmartWheel USA, which has invented a product designed to teach and enforce safe driving habits. Specifically, they’ve invented a sort of steering wheel cover that alerts drivers to unsafe behavior (such as taking hands off the wheel). The wheels also track driving habits so that young drivers can gain a more thorough understanding of whether or not they’re being appropriately safe. Hopefully with all of these tools in place for various types of drivers, the next few years will see the horrific numbers of accident-related deaths finally begin to decline significantly! Cory Bowman is freelance writer and web designer based out of Virginia. His work primarily concerns themes in technology, travel, and lifestyle. Anyone who has been driving cars for a while will vouch for the fact that driving in the rainy season is quite different from doing so in dry weather. When taking your car out on a rainy day, it is very likely that its tires will lose their grip on the road. Your vision will be dramatically affected as well. It becomes difficult to see other vehicles and read the road-safety signs. Getting a clear view of the road also becomes a challenge. Other reasons why driving on a wet road is extremely risky is because when the road gets wet, oil and grime that have settled into it rise to the surface, making the road highly greasy and slippery. This makes it difficult to get traction. Wondering what you can do to ensure safe rides this monsoon? Here are few tips for that. One of the easiest and the most effective ways of preventing an accident on a slippery road is by driving slowly. Reducing speed ensures that a greater amount of the tire’s tread makes contact with the surface of the road, thereby giving you better traction. Keeping your pace steady, avoiding speeding and swerving, and shunning jerky movements at the time of braking, accelerating or turning will also be helpful. You will do well to maintain a considerable distance from the vehicle in front of you as a safety measure. It takes a longer time to stop your car on a wet road than a dry one, even if your tires are of the highest quality and intended for being used on wet pavements. Hence, it is best not to drive too closely behind other cars. Further, keep an eye out for brake lights flashed by the car ahead of you. It is also suggested to turn your headlights on so that other drivers can see you from a distance. Driving without cruise control will also keep you more alert. Apart from your car’s headlights, make sure you turn on the lights at the right time. Bear in mind that you need not use fog lamps unless the visibility is very poor. This is because the rear and front fog lamps may distract other drivers. This also applies to the main beam headlamps as their glare can also leave other driver blinded momentarily. Use them as you would under normal circumstances. So what happens if your car skids on a wet slippery road? Would you instantly start slamming the brakes? While that seems like the right thing to do, avoid doing so. By all means, apply the brakes, but in a firm and a steady manner. If your car has anti-lock brakes, apply more pressure to the brakes but avoid pumping them. Steer in the direction of the skid. In case there is too much water on the road, your car may end up hydroplaning i.e. the tires of your car might lift away from the surface of the road and float on the water. In such cases, avoid slamming the brakes and gently take the foot off the accelerator. Press the clutch and allow the car to slow down by itself. Keep the steering in the direction of travel. Driving in wet weather calls for very high levels of alertness, especially when driving in the dark. Hence, it is best to avoid driving if you’re feeling tired. If you must drive, then take regular breaks by pulling up at a safe spot and taking rest. Apart from that avoid distractions such as using the cellphone, talking, eating, drinking, changing the radio station, turning around to hand items to the passengers in the backseat, playing with your children, and anything else that requires you to take your hands off the wheel. Driving on a wet road with a defective or a bald tire will make it difficult for you to stay safe. It is recommended that you check your tires for tread wear from time to time. Additionally, get the air pressure checked at least once a month. Ask the car mechanic to rotate the tires as part of the routine maintenance to ensure even wear on all sides. Needless to say, if you live in a region which experiences a lot of rain, get tires that are designed particularly for slippery road conditions. Keep in mind that driving through a flood can be extremely dangerous and can cause serious damage to your car. You never know how deep the flood water can be. If you do not see other cars driving through it, play it safe and avoid driving through it as well. The water may be carrying harmful submerged objects, or it could have a strong current which could sweep your car away. It is always better to take another (safer) route. If you choose to drive through, however, keep the car at the highest point of the road and make sure your path is devoid of other cars through to the other end of the water. Other cars may stop, which would leave you stuck in the water as well. Drive slowly and steadily as driving too fast might cause your car to hydroplane. Once you’ve built up speed, try not to slow down as that can result in the water flowing back to the radiator grille and getting into the engine or the exhaust pipe. Either of these can cause heavy and permanent damage to your car. Once you reach the other end of the flood water, drive out of it carefully and make sure to test your brakes before resuming your journey. Come rainy season and the roads everywhere are going to be wet and slippery. Driving safely can be challenging as you try to prevent your vehicle’s tires from swerving/slipping. Apart from that, it also becomes difficult for the driver to see the road clearly, and make quick safety-related decisions. However, you can keep danger out of your way by taking necessary and timely precautions. Adhering to the above safe-driving tips should be of immense help when it comes to dealing with wet roads. Do make sure to abide by them and you should be able to put all your wet-road-driving woes behind and stay safe and sound. Author Bio: Rachel Oliver specializes in laws dealing with traffic defense and related niches. Updated with the latest happenings in the legal world, she shares her experiences and anecdotes through her write-ups on various websites. Interact with her through her Google+. Practicing proper driver safety is a very important part of driving. As a driver, you should be aware of proper car maintenance, safety tips, and also how to react in certain situations. A situation you will definitely experience is driving through bad weather conditions. Many rain showers and thunderstorms pop up in the summer, so understanding how to stay safe during these conditions can help prevent possible accidents. According to AAA, wet pavement contributes to nearly 1.2 million traffic crashes each year. Here are some tips to follow this summer when you are caught driving in the rain. You definitely don’t want to be caught out in a storm without proper working headlights. Checking to make sure your headlights are working before you begin driving should be one of the first things you do upon entering your vehicle. Headlights help you to see the road, and they also help other drivers see you. Not having enough tread depth in your tires causes a higher risk for hydroplaning. You need enough tread depth to allow the rain to escape through the tire’s grooves. In order to check your tire’s tread depth, you can use the coin test explained below. Take a penny, and with Lincoln’s head upside down, put it between the tread of the tire. If you can see the top of Lincoln’s head, your tread is worn down and it is time for new tires. Mavis Tire has a wonderful “Buy 3 Tires Get 1 Free” deal if you find yourself in need of tires. Along with ensuring that your tires have the proper tread depth, you should also make sure your tires are inflated to the recommended pressure. Tires that are under-inflated can cause hydroplaning and can even cause you to lose control of your vehicle. As soon as you notice a difference in your driving visibility or that your windshield wiper blades are squeaking, you need to purchase new blades. Advance Auto Parts offers free wiper installation with your windshield wiper blade purchase. 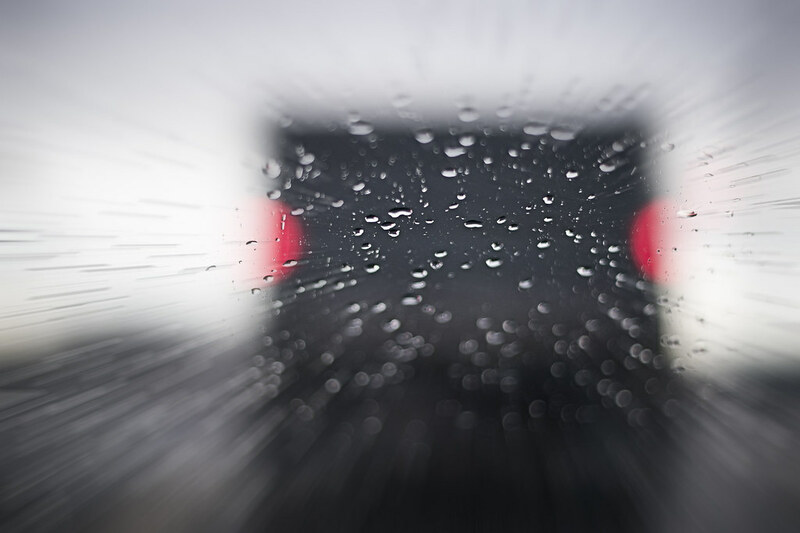 One of the most important tips to remember when driving through the rain is to slow down and reduce your speed. It is not safe to drive through the rain at the same speed you would drive at in sunny weather. Slowing down can improve your safety as well as the safety of other drivers around you. Lauren is a contributing writer and media specialist for Mavis Discount Tire. She regularly produces content for a variety of lifestyle and automotive blogs based around driver safety tips, auto service tips, and more. We’re constantly reminded of the dangers we face every time we get in the car. We pass accidents on the way to work, we hear about fatal collisions on the news at night and, from time to time, we read articles on the Internet that link to scary articles telling us that auto accidents are the number one cause of death for teenagers in the United States. We don’t need to be told the importance of safe driving. We do need to know what being safe actually means. There’s more to safe driving than just knowing the universal language of lights and signs. Knowing what to do in potentially dangerous situations is vital, but it’s also hard to practice. Keep the following things in mind when you’re on the road and they might just help keep you in one piece. Overcorrection often turns relatively minor situations into seriously bad accidents. Even the best of us lose focus from time to time. Rumble strips exist for a reason. It’s not always easy to stay calm when dangerous situations arise, but doing so could save your life. In an analysis of 478 real-life rollover accidents, the Association for the Advancement of Automotive Medicine found that overcorrection contributed to 22% of the cases. This means that more than one in five may have been prevented by a controlled response as opposed to a panicked reaction. If your vehicle is leaning over the edge, just ease your foot off the gas and gently nudge it back into the lane. If you’re presented with a sudden obstacle, be it a stalled car or a frightened moose, a quick lane change is generally better than jerking the wheel in a random direction. While it’s far better to underestimate the stopping power of your vehicle, many people don’t know its true potential, either. That may sound odd, but when was the last time you slammed the brake through the floor? If you’re headed straight for an obstacle and there are cars on either side of you – an inadvisable position in the first place – the ABS system is your best bet. The ABS system won’t just help you stop as quickly as possible without skidding; it’s made to let you turn the wheel as you brake. As the vehicles next to you pass by, holding a slight turn can maneuver you around the obstacle. Keep the above advice in mind, though – overreaction has consequences in these situations as well. This is all assuming that your tyres are in good condition. We all know that having a good set will improve the handling of your car – especially in adverse conditions – but research conducted by Goodyear Tire and the NHTSA found that tread depth also has a significant effect on stopping distance. Having high-quality tyres and wheels is of the utmost importance when driving through adverse road conditions. That’s not all there is to safe driving in these conditions, though, and even if you live in the driest of deserts, chances are good you’ll face them at some point in your life. The very best way to handle skidding on a slippery road is to avoid skidding entirely. The speed limit goes out the window when there’s a chance the roads aren’t dry. Go as slow as you need to maintain control. Even just a little rain can bring oil to the surface, and the effects of snow and ice on even the best of tyres is always detrimental. While having electronic stability control and all-wheel drive on board does wonders in inclement weather, everyone should know how to catch a skid. It takes practice, but practice can be as fun as finding your local go-kart facility featuring a “slick track”. It may just be a go-kart, but the skills translate directly to the real thing. While careful driving and acute attention to the road – and the laws of said road – are vital to the safe operation of an automobile, situations like the ones described above are sometimes simply unavoidable. Keeping a clear head and following the advice you’ve just read can mean the difference between a day at the beach and a trip to the hospital. Make the right choices at the right times and you’ll hit the beach every time. When you’re on the road, you’re automatically prone to accidents. However, some people are more prone to road accidents than others and they are people who are employed as drivers. These include bus drivers, truck drivers, heavy vehicle drivers and delivery drivers and anyone who drives as part of their job. Here are some tips that both employers and employees can use for safe work related driving to minimize the likelihood of road accidents. It is an employer’s duty to control the daily driving hours by assigning tasks accordingly. The recommended limit for driving each day is 9 hours in total. Also, no driver must be required to drive more than 4 hours consecutively. A break after a few hours is necessary to prevent accidents and ensure the driver is alert at all times during driving. Employers must make sure not to assign tight delivery deadlines to drivers as they may resort to rash driving, which increases the risks of accidents by many folds. Employers must assign each drivers tasks accordingly to ensure the business operations run smooth without any mishaps or accidents. Is driving unavoidable? Can the meeting be done via telephone, video chat or any other way? Can you send someone on foot, or on bike? An employer must answer these questions to think of ways to avoid driving as it increases the risk of work related driving accidents. Every state has laws for worker safety, thus employers should offer a workers compensation benefits program or insurance coverage to help employees in case of a work related injury. This works for the benefit of employees. An employer has the right to hire a work injury lawyer to file a lawsuit in case the employer denies benefits. All employers must issue a written document that states that the vehicle is safe for driving. This especially is essential for vehicles that are older than three years. These documents should be revised and the vehicles should be investigated once a year to see whether they’re up to working standards. First and foremost, all employees must follow the prescribed road and driving safety rules. This includes not driving under the influence of alcohol or drugs, ensuring passengers are safe when a driver is behind the wheels, driving on a particular side of the road, rules for overtaking, driving in different weather conditions, etc. Drivers should know what actions to take in case of an emergency situation. E.g. in case of an accident or in case of vehicle failure, poor weather conditions, etc. You must have the knowledge of different routes, have some knowhow about the red signs in a vehicle so you can detect problems and have them sorted before they occur and cause accidents. The importance of driving within speed limits can never be overemphasized. As a driver, it is your responsibility to make sure you follow road safety rules and drive within the given speed limits, follow the signboards, not cross the red traffic sign, etc. It is very important to follow the route advised by the employer. This will help you and employer stay on the same page and will allow the employer to make necessary arrangements accordingly in case of emergency. It is also important for you to report any defects in the vehicle to the immediate manager and make sure to not to drive that vehicle. Most employers will take action and cease the use of such a vehicle until it is safe for driving. Work related injuries due to road accidents are common. It is important for both employer and employee to ensure that all safety precautions are taken to minimize the occurrence of unfortunate incidents which can result in huge losses for a business in form of vehicle costs, penalties and charges, poor traffic records, and high number of workers compensation claims. If you are looking for Workers Comp Lawyer in PA so you can contact The Cardamone Law Firm, LLC.